She received her diagnosis in August of 2010. Lung cancer. Now what? She was presented with a number of treatment options with varying degrees of side effects. None of the treatment options would cure her, the cancer was too advanced. But each would extend her life. Whether it would be weeks or months, even a year or two, nobody knew. My mom chose “none of the above” when it came to treating her for lung cancer. She was determined to live her final days, weeks, months or years to their fullest, as much as she was able. She died within two months of her diagnosis. But those final two months, with the exception of the last few days, she lived fully. She worked in retail, kept her house clean, prepared her meals, read and, most importantly for her participated in worship at her local church. This was how she defined “quality of life”. Bill Davis is a philosophy professor at our denominational college, Covenant College. He teaches end of life issues for the last 30 years. He has a vast amount of experience when helping people face what we will all face one day, our death date. ethics. But as importantly, he has served and serves on boards of ethics at various hospitals. He is also an elder at a local PCA church in Lookout Mountain, GA. In the classroom, boardroom and hospital room Dr. Davis has grappled with end of life issues for the last 30 years. He has a vast amount of experience when helping people face what we will all face one day, our death date. 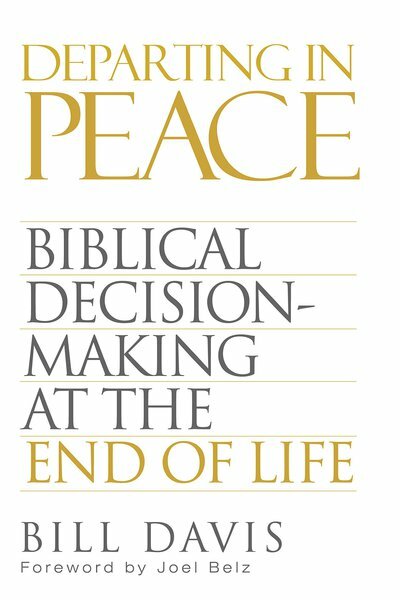 This book is both foundational and practical. If I could buy a copy and dictate that every family in our church read it, I would do it. Because we do not know our death date, all of the questions and consequences and anxiety when faced with death, come when God is preparing to take us. The fog of the impending or recent death of our loved one can create an impediment to wise and faithful thinking. This book lays it all out in a very accessible, readable way. 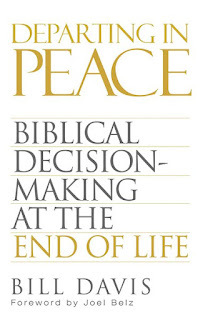 From end-of-life treatment options to financial considerations, to step-by-step advanced directives, to real-life stories where biblical principles were put into practice, Dr. Davis gathers his wealth of experience and his pastoral heart and provides it all. Part of how Dr. Davis will encourage us to define “quality of life” is in the Christian’s ability to continue to meet with the saints in corporate worship, to read God’s Word (or have it read to them) and to continue to enjoy communion with God through prayer and His other means of grace. What an incredibly clear and refreshing goal for those living their last days on this earth. This is what carried my mom into His presence. May we all die so well.